W.L. Weller Antique is one of the earliest bourbons I tasted for this blog (now about 2 years old, wow). Back then, it impressed me over time, proving surprisingly meaty for a wheated bourbon. Tonight, I’m giving another W.L. Weller expression a try – the W.L. 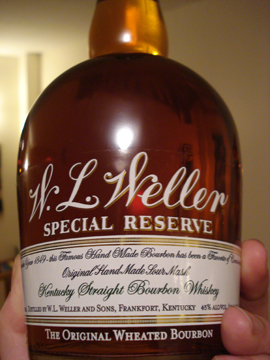 Weller Special Reserve. This bottle seems to have more than its share of fans out there on the internet as a bourbon with a good quality to price ratio. This internet thing has led me down some dead ends before, but let’s see what this seven-year aged, wheated bourbon has to offer. Judging from what I’m seeing on Google image search, it looks like Weller Special recently switched bottles from the common, broad shouldered bottle to something more bulbous and generally more dignified – if only because it’s not the same bottle that Rebel Yell uses. The label sits very low on the bottle, right down near the base, and informs its viewer that this bourbon has been enjoyed by connoisseurs since 1849 – the same year referenced by one of my favorites, Old Fitzgerald. This is no surprise considering these brands share a common heritage in Mr. Weller. The name and description is printed in old-timey bourbon script while the rest of the type in gold-trimmed block lettering on a white background. The low placement and rounded contours of the new bottle do a lot to show off the bourbon inside and is generally quite appealing. On the nose Weller Special comes across very sweet with notes of raspberries and mango as my first impression. There’s also a bit of grass in there, but with an edge of char from the barrel. Very bright and pleasant. That same sweetness comes through on the tasting as well, in fact it’s sweet from start to finish. It’s one of those bourbons with a light mouth-feel and high berry flavors such that it comes across as almost juicy. Right at the start the grassy flavors and wheat influence express themselves and stick around even as berries and candies come into play. This bourbon dances toward the tip of the tongue as the finish is still boldly lemon-drop filled, but retains a slight spicy/warm edge to it. This couldn’t be more different from Weller Antique in its disposition. Where Antique is an ornery companion with some good stories to tell, Special Reserve is happy-go-lucky and filled with bright colors. This isn’t my favorite style, but this is done pretty well I have to admit. The grains come through in a great way and this is really just a pleasant drink. I have to say I can see why this is seen as such a good deal – at $17 it certainly over-delivers. We drink the sh!t out of this at our house. Tasty enough to drink on the rocks, yet cheap enough for my wife to mix with ginger ale. Great bourbon but this review is as gay as can be. This is my go to Bourbon, at $18 per liter it’s one of the best bargains in the whiskey world. W.L Weller Special Reserved is a great Whiskey and I’m happy to settle down and don’t have to search anymore because I found love. I’m introducing it to moma.